First purchase an ornamental fish bowl of your choice preferably of large size (above 2 gallon capacity). You can save on the costs if you scout for the ornamental fish bowl at glassware store where they will be priced much cheaper than they are at the pet stores. Then buy some smaller sized glass beads and colour rock chips to fill 3/4 inches of its bottom at your pet store. You can also pick up decorations and artificial fancy plants with natural look to add life to your container. The artificial plants must be kept sparingly, giving sufficient room for your pet to move around. Also buy a handling net of fine soft material and an aerator pump of small capacity, to be handy, if you want to go in for pats like goldfish because as the it grows its oxygen demand goes up and you may be required to aerate the water. Then comes the selection of the species for our aquarium. 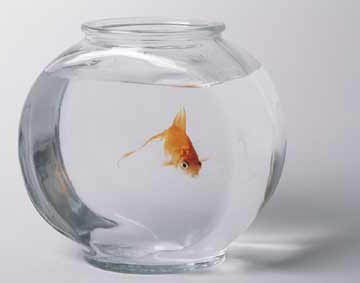 Betta, goldfish, guppies and dwarf gourami are some of them which can be raised in the container. You can keep a pair of gourami or guppies; Betta and goldfish are to be kept singly. Ensure that the selected pet is healthy and insist that the pet be packed in a bigger double polythene bag containing sufficient water; sufficient oxygen must be released into the bag. Also buy the appropriate feed for the type of pets you have selected. If your fresh water source is chlorinated then buy water conditioner. Also buy two holding vessels of plastic of about 2 gallon capacity for keeping the pets when you change water or clean the container. Also buy a mesh cover and a siphon tube. Now with these materials you can set up the ornamental fish bowl. Look into other post for further steps to be taken.